​Edie Jane Eaton is one of the Tellington TTouch International Instructors as well as a Feldenkruis practitioner with a love of all animals especially cats, dogs and horses. 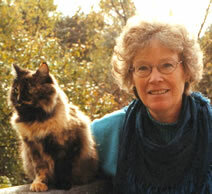 Her introduction to TTouch came about when her Feldenkruis mentor suggested she look into the work of Linda Tellington-Jones. In addition to founding TTouch, Linda is also a Feldenkruis practitioner and Edie Jane says that once she saw Linda work, she was utterly hooked. There's an old saying that goes, "Take care of the pence and the pounds will take care of themselves." That's what "listening to whispers" is all about: paying attention to the small things in order to make changes in the big things. Who doesn't dream of making changes in their life - whether in performance, comfort, tension, stress or behavior? For both human and non-human animals alike, many small habits of posture and action, attitude and belief determine and underpin everything we do. These habits may make life easier, but not all may be as useful as we'd like. They may get us where we want to go, but at some cost. In fact, some habits result in pain, anxiety, distress, ineffectiveness and even disease. Some of our habitual postures and tensions are linked to emotional states, making our emotional responses ones of habit rather than choice. Recognizing the habitual ways we do things, and opening ourselves to other possibilities, can make all the difference. Have you ever passed a turnoff along a road because you were driving too fast, missed a sign or were inattentive? We may be missing similar opportunities for changing aspects of our life if we rush through it; function on "autopilot;" or become fixed on the outcome rather than the process. The opportunities may be there, but unless they shout at us, we don't hear them above the background noise of our lives. Slowing down and softening our senses lets us listen to the whispers that may be saying "this is what you are doing . . . how about trying this instead?" We become able to discover and appreciate other possibilities. Whether we play music or a sport and wish to do it better; whether we have pain or dysfunction; whether we have a dog who is afraid of thunder or pulls on the leash; or have a horse who seems resistant - the process of change is the same for all. Change requires an awareness of other possibilities, of choices in movement, posture, behavior etc. We, or our animals, have to feel confident about exploring those choices. The techniques of the Feldenkrais Method and Tellington TTouch awaken awareness, provide choices, and support the process of exploring and living with those choices - all the while listening to the whispers!